I don't think I'm blowing anyone's mind here when I say that dogs are the absolute greatest. I could wax poetic on all the reasons why, but that would take days/weeks/months so right now we're just going to focus on how openly they wear their emotion on their sweet, furry faces. It's rare that you question where you stand with a dog. Is it wearing a big grin? Great, the dog is happy and probably wants to hang out. Are its hackles raised and its ears back? Maybe you should leave it alone/guard your vitals. 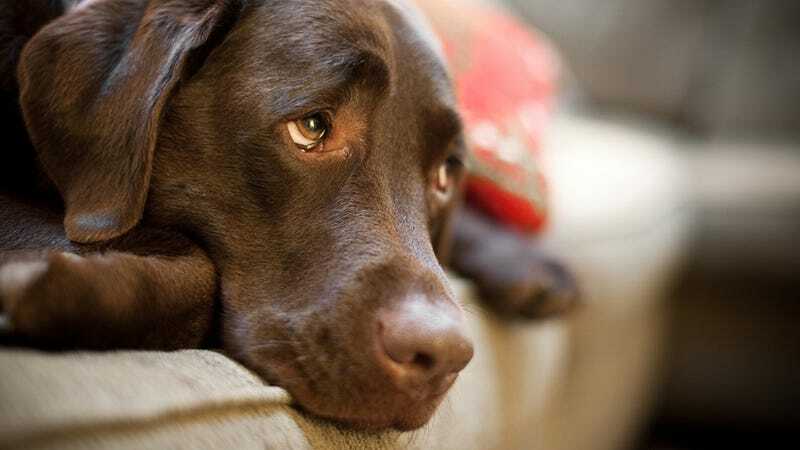 Trust your instincts on this one because scientists at Walden University in Minneapolis, MN, have recently proven that most humans are fairly-to-greatly adept at reading a dog's mood from its facial expression, which demonstrates an even greater emotional connection between our species than previously thought. Using Mal, a five-year-old Belgian shepherd, researchers created different scenarios to incite specific reactions on the dog's face, like using praise to make him happy, reprimanding to make him ashamed, showing him a pair of nail clippers — because Mal hates having his nails trimmed — to make him scared and so on. Mal's facial reactions were photographed and then the photos were shown to 50 volunteers who had been split into two groups based on their amount of experience with dogs. 88% of the volunteers were able to identify happiness and 70% were able to identify anger, but identifying the more nuanced emotions was slightly more challenging. Only 45% were able to spot fright, 37% could spot sadness and only 13% could pick out disgust. Surprisingly, it was those with less experience with dogs who were generally better at identifying Mal's emotions than those with a lot of experience. Researchers speculate that this is because identifying a dog's feelings might be a natural skill rather than a learned one and that dog owners, who are often very attached to their pets, misconstrue their animals' emotions because they want to believe that they're happy.